A bright, spacious, award-winning bed and breakfast in idyllic County Waterford, Fern Hill is the ideal South East getaway. A luxurious home, guests can enjoy a delicious breakfast menu, a comfortable guest lounge and spectacular sea views. Situated in the popular seaside resort town of Tramore, visitors can get out and about with golf, surfing, swimming, horse riding, hiking, fishing and beautiful beaches all on the doorstep. Splashworld leisure centre and Tramore Amusement Park are also nearby and are sure to keep kids entertained throughout their stay. Guests can enjoy complimentary tea/coffee and home baking on arrival. Enjoy period elegance in a beautifully restored 1920s home at Glenart House, County Waterford. Located in the busy seaside town of Tramore, guests will be kept busy on idyllic stretches of beach where they can surf, swim, sail or just enjoy a stroll. Visitors can indulge in all the fun of race day at Tramore Racecourse, as well as while away the time fishing, hiking, golfing or horse riding. Nearby Splashworld leisure centre and Tramore Amusement Park are also perfect for keeping children entertained. 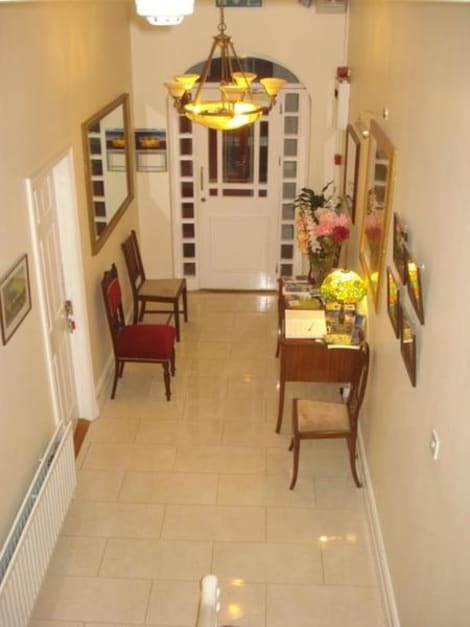 A spacious and comfortable 4-star bed and breakfast set upon an acre of leafy gardens, Cloneen is an cosy haven in charming Tramore, County Waterford. Close to the idyllic Doneraile Walk which boasts unrestricted coastal views from Tramore’s cliffs, guests can admire the renowned scenery and sandy shores of the popular seaside town. With golf, Splashworld aqua adventure centre, Tramore Racecourse and many pubs and restaurants nearby, visitors can enjoy an active stay. Welcoming guests for 28 years, hosts Neil and Maria Skedd provide private parking and delicious breakfast menus. Enjoy period luxury at Killerig House, a 200-year-old Georgian townhouse overlooking idyllic Tramore Bay, County Waterford. Lovingly restored, the house boasts an array of original features and a charming ivy-clad exterior. With bright, spacious rooms and delicious breakfasts - including the traditional full Irish, guests can unwind in the serene surroundings. Only 10km from Waterford city, the popular seaside resort of Tramore has plenty to keep visitors entertained. With water sports on the beach, Splashworld leisure centre, golf, horse riding, cycling and walking routes, as well as lively Tramore Racecourse, visitors will enjoy the best of County Waterford. lastminute.com has a fantastic range of hotels in Tramore, with everything from cheap hotels to luxurious five star accommodation available. We like to live up to our last minute name so remember you can book any one of our excellent Tramore hotels up until midnight and stay the same night.